Webster University's two most recent major construction projects have received awards recognizing their quality of design. Webster University’s Browning Hall, the Interdisciplinary Science Building, was recognized for its design excellence this year by the American Institute of Architects (AIA) St. Louis Chapter. The Arcade Building, home of Webster University’s Gateway Campus, also was recently recognized for its excellence. In the Sept. 22 – 28 issue of the St. Louis Business Journal, the Arcade Building was named as best “conversion or renovation project” with a budget greater than $10 million in the St. Louis region. The award was part of the paper’s “Building St. Louis” honors. The historic Arcade Building was empty for nearly two decades and in disrepair when it was purchased by Minnesota-based Dominium Development in 2009 and renovated into a joint commercial-residential space. 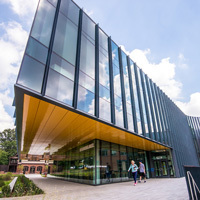 Webster University’s Gateway Campus occupies 54,000 square feet of the first two floors of the building for classroom space, offices, an auditorium and an art museum. Webster’s portion of the building includes the original 35-foot-tall barrel-vaulted ceilings, marble floors, and all original terra-cotta and woodwork. The rest of the building houses 282 apartments and is managed by Dominium Inc. The Arcade Building renovation completed in 2015, with classes from Webster's Gateway Campus beginning there in 2016. Browning Hall was honored by the AIA through a juried process, which recognized excellence in the categories of architecture, interiors, unbuilt and craftsmanship. The new building triples the number of science labs on campus, supports greater academic collaboration, and positions the University to meet the region’s employment needs for decades to come. Features include new laboratory classrooms, a dual computation laboratory/classroom, faculty offices and staff offices, and a 129-seat auditorium. There are commons areas throughout the building for students and faculty to collaborate and hold study sessions. Browning Hall houses the departments of Anthropology and Sociology, Biological Sciences, International Language and Cultures, Nurse Anesthesia, Nursing, Psychology and the Institute of Human Rights. The building was designed by Cannon Design, with Paric as general contractor. A public dedication and academic symposium will be held at Browning Hall on Thursday, Oct. 19, with public lectures, events and tours to the community, including a ribbon-cutting ceremony.